A transit of Jupiter across the Sun as seen from an outer planet (Saturn, Uranus, or Neptune) takes place when the planet Jupiter passes directly between the Sun and the outer planet, obscuring a small part of the Sun's disc for an observer on the outer planet. During a transit, Jupiter can be seen from the outer planet as a small black disc moving across the face of the Sun. Jupiter's satellites could be seen at the same time, but their angular diameter would only be about 1" at Saturn and even less for more distant planets, and they would therefore be very hard to see. The Jupiter-Saturn synodic period is 19.85887 years (7253.45 days). The mutual inclination of the orbits of Jupiter and Saturn is 1.25°. 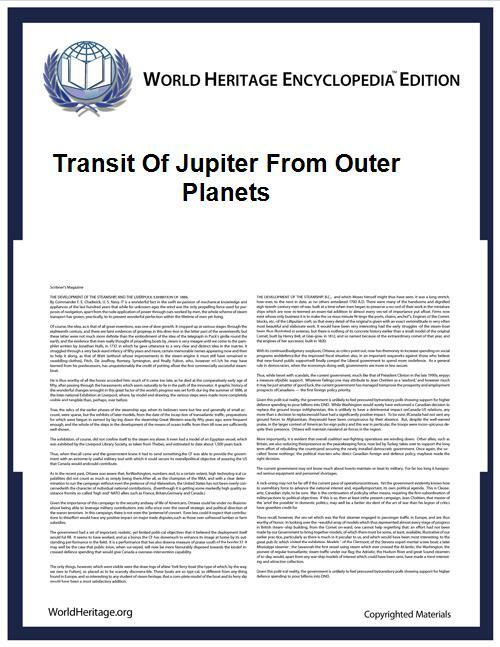 The most interesting case would be a transit of Jupiter from Saturn. The last one was in 1226, and the next is in 3728; but both are grazing (the center of Jupiter would not appear to pass over the Sun to an observer at the center of Saturn). Jupiter's center last crossed the Sun in 86 BC; the next time comes in 7541. Jupiter will block from five to six percent of the Sun in those transits, more than any other transit involving two planets in the Solar System. The Jupiter-Uranus synodic period is 13.81195 years (5044.81 days). The mutual inclination of the orbits of Jupiter and Uranus is 0.70°. The Jupiter-Neptune synodic period is 12.78219 years (4668.69 days). The mutual inclination of the orbits of Jupiter and Neptune is 0.94°.